Fuji fans, there is something exciting to happen on Saturday, March 30 in our shop in Mariakerke … We can not say anything about it yet, but we promise you: it is worth a visit! 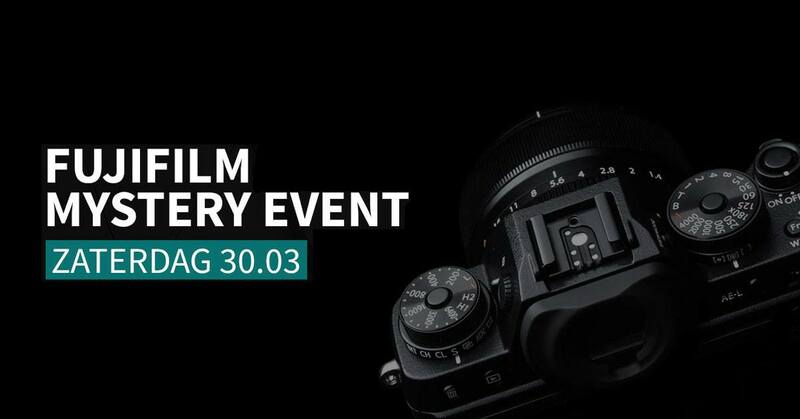 Photographer & Fuji Ambassador Ioannis Tsouloulis will be ready that day to explain the whole event & answer all your questions. Moreover, the weekend is the last days of the Fuji – X Series cashback, where you receive up to € 600 of the purchase price on participating models. An extra reason to be there that day! This entry was posted in Fuji Event, Fujifilm GFX, Fujifilm GFX 100S, Fujifilm GFX 50R, Fujifilm GFX 50S, Fujifilm X-T30 and tagged Fuji GFX, Fuji GFX 100M, Fuji GFX 100R, Fuji GFX 100S, Fuji GFX 50R, Fuji GFX 50S, Fuji GFX100M, Fuji GFX100R, Fuji GFX100S, Fuji GFX50R, Fuji GFX50S, Fuji Rumors, Fuji X-T30, Fuji XT30, Fujifilm, Fujifilm GFX 100M, Fujifilm GFX 100R, Fujifilm GFX 50R, Fujifilm GFX100M, Fujifilm GFX100R, Fujifilm GFX100S, Fujifilm GFX50R, Fujifilm GFX50S, Fujifilm Rumors, Fujifilm X-T30, FujifilmRumors, Fujirumors, GFX, GFX 100M, GFX 100R, GFX 100S, GFX 50R, GFX 50S, GFX100M, GFX100R, GFX100S, GFX50R, GFX50S, Medium Format, Super Full Frame, X-T30, XT30. Bookmark the permalink. Trackbacks are closed, but you can post a comment.